The paper entitled "genEnsemble: A new model for the combination of classifiers and integration of biological knowledge applied to genomic data" is between the 25 most downloaded publications of Computer Science at Elsevier. You can see the list here or here . 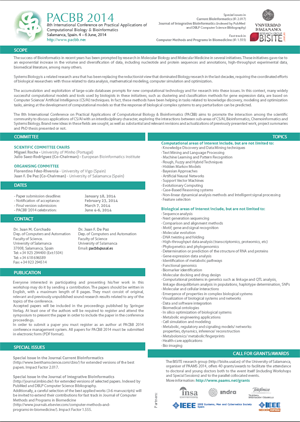 The 8th International Conference on Practical Applications of Computational Biology & Bioinformatics (PACBB) aims to promote the interaction among the scientific community to discuss applications of CS/AI with an interdisciplinary character, exploring the interactions between sub-areas of CS/AI, Bioinformatics, Chemoinformatics and Systems Biology. The 7th International Conference on Practical Applications of Computational Biology & Bioinformatics (PACBB) aims to promote the interaction among the scientific community to discuss applications of CS/AI with an interdisciplinary character, exploring the interactions between sub-areas of CS/AI, Bioinformatics, Chemoinformatics and Systems Biology. Recently, our group leader, Florentino Fdez-Riverola was invited to belong to the Editorial Board of Inteligencia Artificial Journal (ISSN 1988-3064) - http://journal.iberamia.org/. Inteligencia Artificial is a quarterly journal, now promoted, sponsored and edited by the IberoAmerican society on Artificial Intelligence (IBERAMIA). The journal publishes high-quality, original, research papers reporting theoretical or applied advances in all branches of Artificial Intelligence. In addition to rapid publication and dissemination of unsolicited contributions, The journal is also committed to producing monographs and special issues on topics of special relevance to the AI community. Inteligencia Artificial Journal is indexed at SCImago Journal Rank/Scopus, DBLP, Latindex, CrossRef, E-revistas, DIALNET, RECYT, among several other indexes and is a reference at search engines. Our group leader, Florentino Fdez-Riverola has been recently invited by R. Roy (Editor-in-Chief) to join the Editorial Board of ASOC, the Official Journal of the World Federation on Soft Computing (WFSC). Applied Soft Computing, published by Elsevier, is an international journal promoting an integrated view of soft computing to solve real life problems. Soft computing is a collection of methodologies, which aim to exploit tolerance for imprecision, uncertainty and partial truth to achieve tractability, robustness and low solution cost. The focus is to publish the highest quality research in application and convergence of the areas of Fuzzy Logic, Neural Networks, Evolutionary Computing, Rough Sets and other similar techniques to address real world complexities.